1985 TVR Tasmin 280i - I think it's been almost 2 months since I featured a TVR. It's time for another one. This is an 11,000 mile unrestored car. The dashboard shows some cracking in the veneer, but other than that, it appears perfect. Located in Maitland, FL, click here to see the eBay listing. 1993 Mercedes Benz 300CE - The more I read and write about the W134 Mercedes, the more impressed I am by them. This is a relatively rare 300CE. The very well made insulate top makes it a car you could drive all year round. The 300 series cars are not perfect. Poorly maintained ones are prone to headgasket failure and early ones had wiring harness issues, but if you find a well maintained one and keep on maintaining it, it can go for 250,000 miles or more. This is a 112,000 mile car that appears to be in very nice condition. 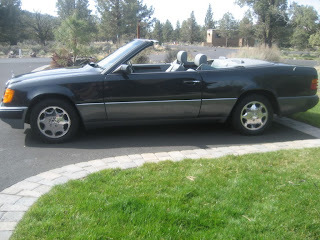 Located in Eagle Crest, OR, click here to see the Craigslist ad. "This car was built for a man who saw a vehicle in Italy designed & built on an Alfa-Romeo drive train by Bertone Studios and wanted to buy it. Bertone would not sell it to him. It was called a Carabo by Bertone. So the man came back to California & hired Sam Foose, who is the father of the now well known Chip Foose. It is a one of a kind that is built on a 1972 DeTomaso Pantera drivetrain." It's not an exact replica, but it's close. This is not a car for people who enjoy anonymity. Located in West Palm Beach, FL, click here to see the eBay listing. Click here to see some pictures of the real Alfa Romeo Carabo. 1998 Range Rover Custom Convertible - Like the Foose built car above, this is not a vehicle that I would buy, but it's interesting. This is a 1998 Range Rover that has been converted to a convertible of sorts. Chopping the roof off a car is always bad news for its structural integrity. Whoever did this conversation added a few roll bars, but the seller doesn't mention if there was any other support pieces added. Take this Range Rover over a bumpy road before buying it and see how badly (or not) it shakes. I'd call this a Strange Rover. Buy a W124 Benz at some point soon. You know enough about cars to get one in decent shape. I have owned 2 different ones (out of 9 used Benzes altogether) in various conditions. I am highly confident that you will really enjoy it. Why? well, umm, let's see: Having owned a 1962 Triumph, a '68 Sunbeam, several Opels, 2 Peugeot 404s, several Fiats, a 318i, VW Rabbits and the odd Toyota,Pontiac and Fords (even a Cortina), I am pretty confident there is an overlap between our taste in cars.It is a Golden Moment for buying a W124, the best of the older Benzes (the 115) are rusted with a billion miles on them or converted to vegetable oil. The newest are crammed with electronics, still pricey and have some quality issues. The early 90s 300E & its derivatives are the Goldilocks of Benzes right now. I'll go with Alden on this one. A couple or more years ago I started reading about horror stories regarding the early ML Series 4x4's (and other models) on an internet forum called "Mercedes-Benz-USA.com." The site is still worth reading as a cautionary note. In addition dealers and repair shop owner's post entries as to when "the last good MB's were made." "...Due to the high cost of German engineer-build-quality, the W124 was designed to last many miles, with awards actually given and worn by high mileage versions (155k, 312k, 465k, 620k, 1,000k miles). This unique characteristic of ownership explains the surprising number still on the road 14 years after the last one rolled off the assembly lines. Cost cutting became critical in the mid/late 90s as the 'no expense spared' over-engineered Mercedes-Benz models with a solid construction and the use of quality materials struggled to compete in price against mass-built Japanese high end cars." That's good enough reason to be cautious. Up to the W124, Mercedes would build a car and stick a price on it, after the W124, the bean counters took charge and everything was built to a price. I have one of these odd conspiracy theories, If Mercedes kept building cars such as the W124, would they ever have been able to stay in business? I know a couple of W123 owners still using there cars as daily drivers, actually another using a W114 as the odd run around the city (he is in his 70's and owned it from new). What amazes me, is that Mercedes built a line of cars that are still used daily even 40 years on (a few lifetimes in car development). They don't look out of place and ride just as well as all there modern counterparts. The W115/123/124 were way ahead of there time, I don't think we will ever see such a well engineered product on our road again.